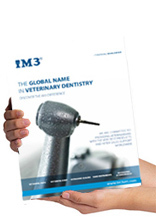 The iM3 blog is designed to provide Veterinarians with up to date industry news on veterinary dentistry and related topics from throughout the world. Today, dental radiology is an essential part of practicing quality veterinary medicine. In the USA, intraoral radiology is close to being standard practice if you want to diagnose and treat oral diseases. In this issue of Professional Liability, we’ll look at three closed claims with older, small-breed dogs that sustained jaw fractures during dental procedures. This is a case report by Adjunct Associate Professor Anthony Caiafa of the North Coast Veterinary Specialists in Sunshine Coast Queensland, Australia. As veterinary dentists, you know that the needs of your four-legged patients demand the most specialised attention. Pets that come in to your clinics have individual needs—a proof that a generic solution does not work for all of them. Every condition and every patient profile require a tailored treatment that is perfected only through years of periodontal practice. View our full range of veterinary dental products.